I've been on a macro binge for a while now, although mainly because not feeling motivated to go out anywhere, especially now that it's getting cold. 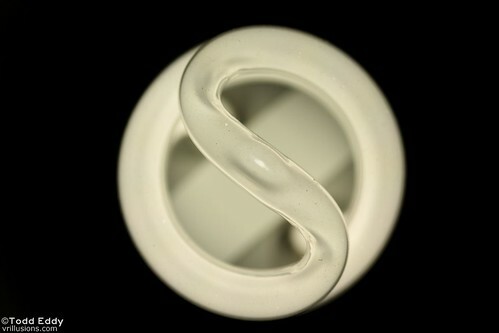 This time it's of a CFL light bulb. Anyone that uses CFL bulbs know they have a warm up time where it's not producing the full amount of light. I wanted to make just the top part of the bulb in focus, which meant I would need a large aperture. That means I will be letting in a lot of light. To combat that I made my ISO as low as it could and the shutter speed was getting really close to 1/8000, which is the max. Once I turned the light on I only had a few minutes to get a good picture before it would be too bright. After taking several this one had the best color balance to it. Post production was just bringing the black end of levels up to make sure the background was completely black, which it almost was already. A tip I learned from this. If you are cleaning the eyepiece and want to see the dust and dirt shine a really bright light--like a light bulb--into the camera and the dirt showed right up and made it easy to clean.